offers you their latest models - the Aquarius JP108 and Orion JP109. years. No other model has proven as reliable, user-friendly, and ideally suited to most US water conditions as the Melody. water....The Aquarius J108 and Orion J109 models. So what makes these latest models- Aquarius and Orion- even more user friendly and advanced than the Jupiter Melody? The Aquarius and Orion while identical on the inside, present to you a choice of two distinctive Westernized exteriors. The Orion with its sleek curves and stainless steel look is an easy match for those liking understated eloquence. same alkaline settings will produce different alkaline levels in different areas. change in your water pressure or flow rate. 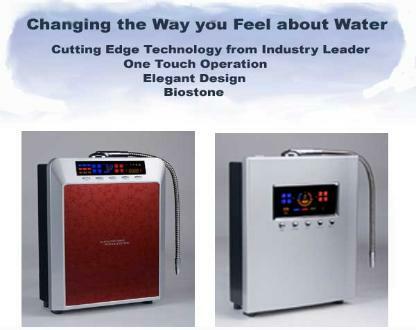 you remineralize or clean your water before it enters your Jupiter ionizer. magnification, you can see that the electrodes are now covered in a super fine mesh with very distinct points and valleys. of price, will produce under similar conditions, such a high and low pH or ORP (Oxygen Reduction Potential). is up, reminding you to change your filter. symbols and colors identify the type and level of water you have selected. The MICOM control system optimizes the pH and ORP of your water and helps keeps your ionizer in top working condition. A new indicator light alerts you if service is needed on your ionizer. Aquarius and Orion/ Alphion. Offering a five year warranty is another world first for Jupiter Science. carbon from the UK, Natural mineral calcium from Japan and KDFA certified Biostone ceramics from Korea. simply switch the sound ON/OFF as you desire. * 9 settings of pH with easy convenience of one-touch operation. * Enhanced convenience in filter replacement; the spring-loaded filter housing makes it a snap to replace your filter. * Choice of three repair depots in the USA. We guarantee caring, ongoing support and prompt service.